Garage doors, loot balance, and Halloween! 6:45pm EST - The client update and devblog are live! 6:17pm EST - The server update just hit. Also, we have murderer NPC's in game for Halloween! 6:13pm EST - Still waiting on the update to hit. We are seeing some special Halloween stuff hitting staging on the latest builds - I've added some pictures below. 5:20pm EST - The update is still pending. We took our update stream down to wipe our US servers in the interest of maximizing wipe day gameplay. Follow @Rustafied to know exactly when the update hits. 1:12pm EST - Helk told me it's going to be a bit later of an update today. Therefore, we're going to delay starting our stream for an hour - new start time: 3pm EST. 12:02am EST - Update day is here and we’re seeing loot balance, AI tweaks, performance enhancements, and a new type of door. A new building element has been added: the Garage Door. Taking up the same amount of space as the double door, this new gateway slides up and down when opened or closed. 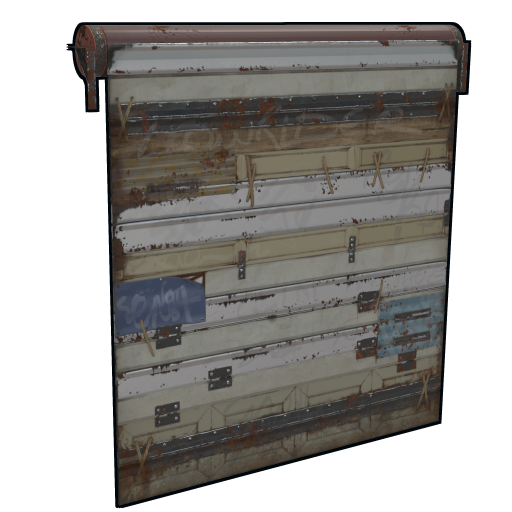 Able to be locked (although lock placement is off at the moment), the garage door is a bit stronger than sheet metal doors and likewise, is more expensive (keep in mind, this could change with balance shifts prior to launch). Unlike the sheet metal door, the garage door is not a default blueprint. Once you find one, it’ll cost 75 scrap to research and then require a level 1 workbench to craft. They are skinnable as well, so expect some visual variations coming soon. Edit: The items you can pick up (stone, wood, ore) along with backpacks have been reskinned to a Halloween theme (and give resources). There's also some spooky new ambient sounds. Edit 2: Murderer NPC's have also been added for Halloween! They spawn around the map, attack you with cleavers, and drop loot when killed. After several improvements to AI last week, we’re seeing more tweaks and additions coming today. Along with advances in invalid destination detection, there have been some fixes to AI and player movement physics colliding. Long and short: animals will hopefully move a bit better after the update. As mentioned in the devblog last week, Helk is planning on changing how loot is dropped entirely. Through shifts to the loot table generation and better item categorization, loot will hopefully be much less RNG feeling, and provide a more rewarding experience overall. As of this moment, these changes have not been merged yet. Edit: There is now an equal chance for all item drops in a tier, however, it doesn't look like the significant changes to loot balance are making it in this week. Server performance has been pretty crappy lately. Thankfully, Helk told me there are a bunch of optimizations coming in today, so hopefully lag and hitches should be greatly improved after the update. Edit: Unfortunately, instead of 1 step forward, we ended up taking several steps back with regards to server performance. It is fucked at the moment on larger servers. We're working with the developers now and just switched our EU Main server to debug mode so they can profile it and see what the issue is. Edit 2: It appears much of the poor server performance was caused by the new server encryption. We've turned encryption to 1 on our main servers and perf seems to be much better. In preparation for Charitable Rust, we’re running a Halloween event this Saturday (Oct.28th) from 5pm to 8pm EST. This will not only be an awesome time, it’ll help us stress test several events for the charity event. Check back here (or follow @Rustafied) for the server information prior to start time on Saturday.